“Even now, says the Lord, return to me with your whole heart” (Joel 2:12). As the Church enters the liturgical season of Lent in preparation for the celebration of the Paschal Mystery, the death and resurrection of Christ, the Holy Cross brothers and men in formation in St. Joseph House seek to heed the prophet Joel’s advice. 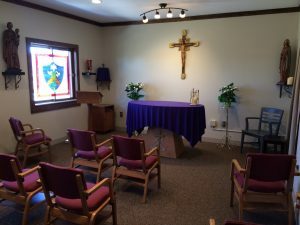 The penitential color violet is used to cover the tabernacle and altar in the chapel, extra prayers are recited before more simple evening meals, and a community service project is planned. We do these Lenten practices not to make our lives more difficult, but to turn our minds and hearts towards what is essential. The small sacrifices of Lent draw us first towards ourselves and our discomfort, but then redirect our attention and prayer toward the passion and suffering of our Lord and, also our brothers and sisters. Only by sharing in the suffering of the Lord can we have a share in the glory of his Resurrection. The season of Lent is a perfect opportunity for us men of Holy Cross to return to the Lord with our whole heart. Our Lenten sacrifices as a community at Saint Joseph House, as well as our personal commitments to prayer, fasting and almsgiving enable us to enter into the season of Lent in order to more properly celebrate the Resurrection at Easter. — Jacob Eifrid is in the Aspirancy Program at St. Joseph Discernment House, Holy Cross College, Notre Dame, IN.